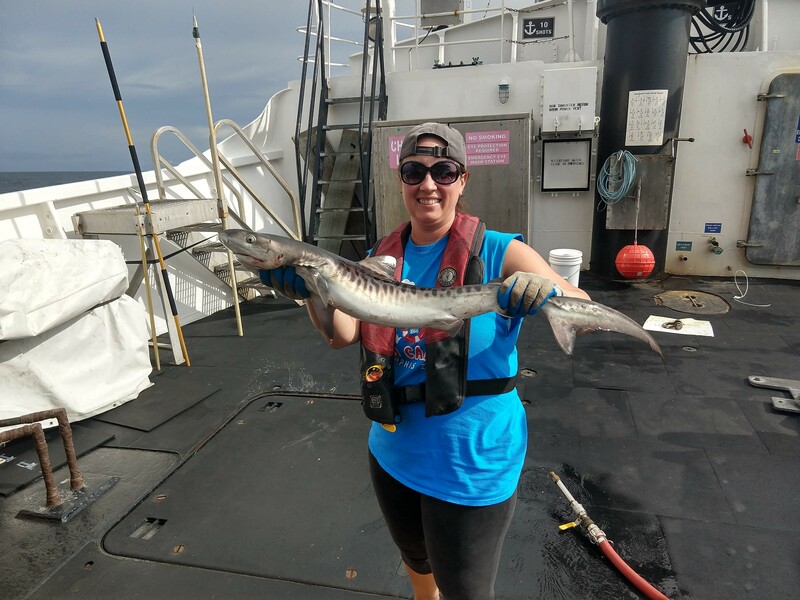 Over the past few days, we’ve fished a mix of station depths, so I’ve gotten to see a number of new species as we’ve moved out into deeper waters. 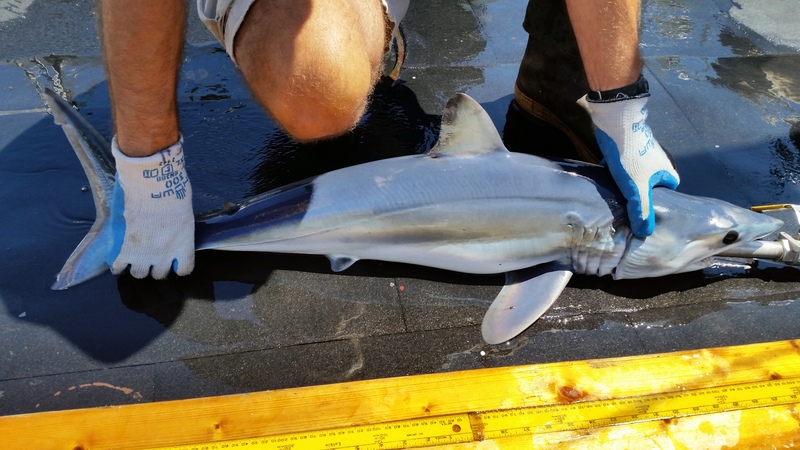 At a C station, which is a station at depths between 183 and 366 meters, we caught a Mako Shark (Isurus oxyrinchus). 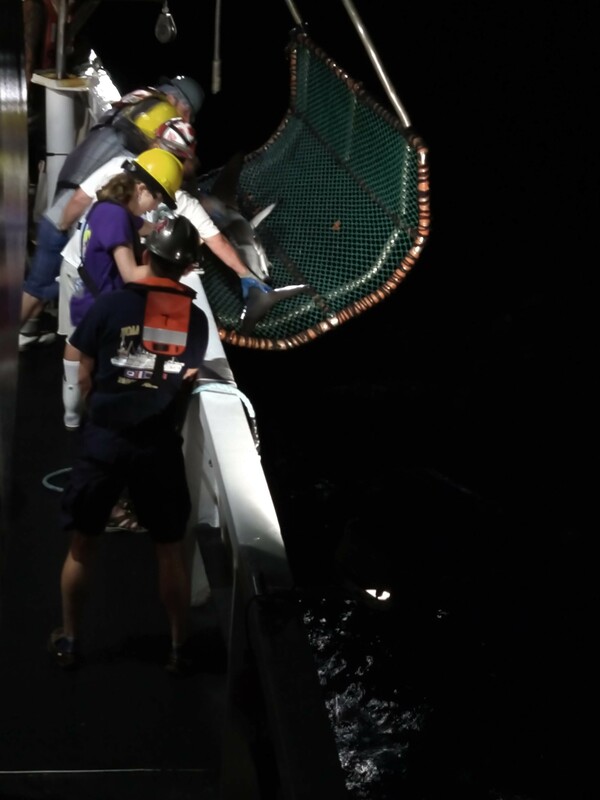 This catch was so unexpected that a number of crew members ventured out to the well deck to snap a picture. She was a beautiful juvenile between 1-2 years old. I also saw my first kingsnake eel, a long eel with a set of very sharp teeth. 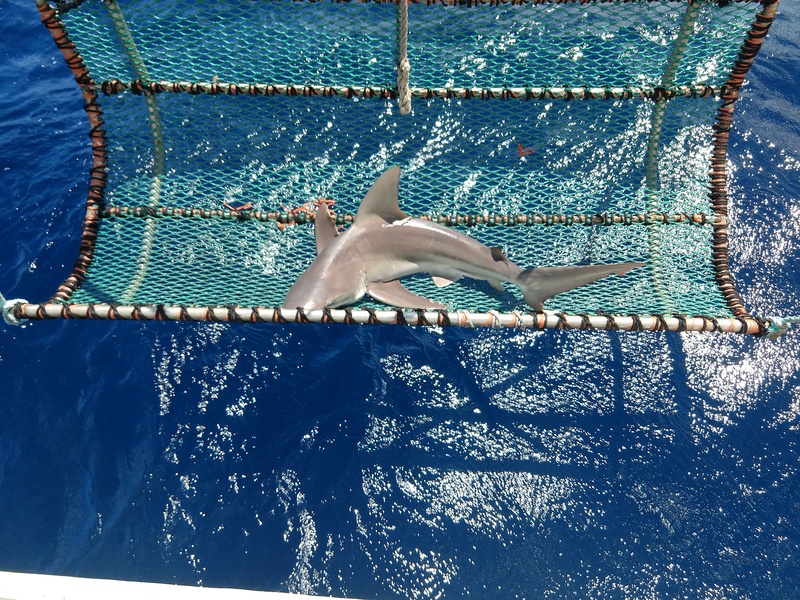 On a later station, we caught a juvenile that we were able to bring on deck and examine. 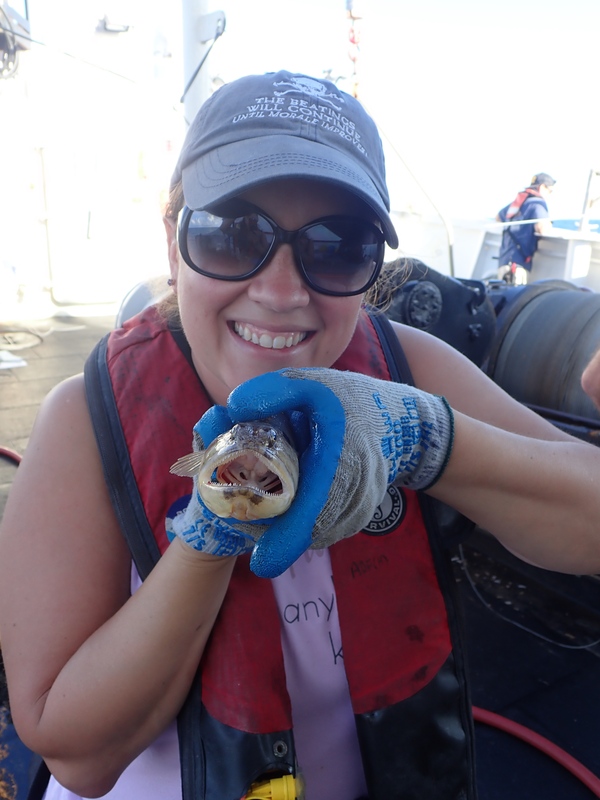 We also caught a Warsaw grouper (Hyporthodus nigritus), which had parasites on its gills and in its fins. Gregg Lawrence, a member of the night shift on loan from Texas Parks and Wildlife Coastal Fisheries unit, and I removed the otoliths and took samples of the parasites. We had one catch that brought in 20 Red Snappers. 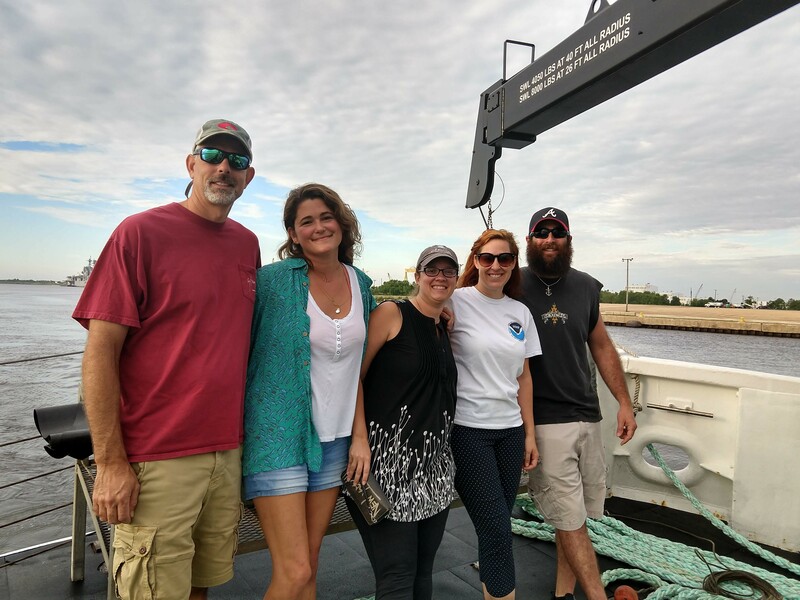 Red Snappers are brought on deck, and a number of samples are taken from each one of them for ongoing assessment of the Red Snapper population. 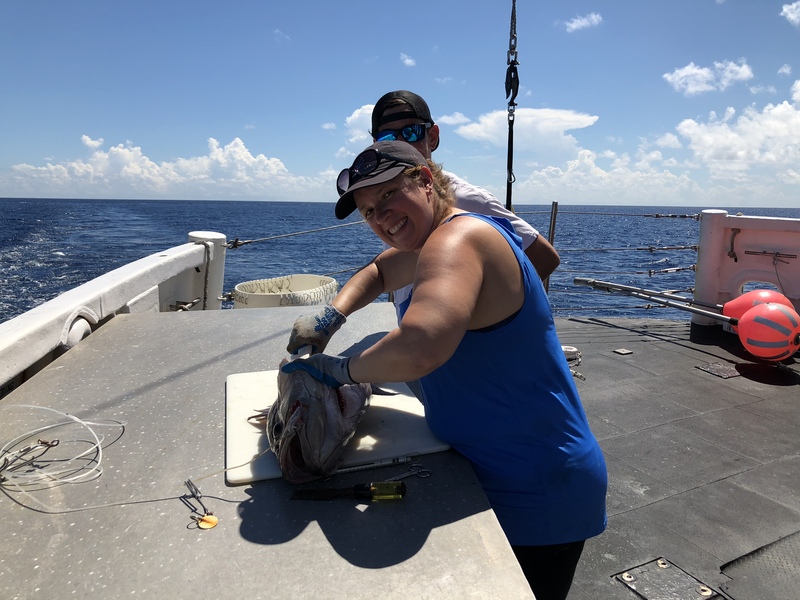 In addition to the otoliths, which allow the scientists to determine the age of the fish, we also take samples of the gonads, the muscle, the fins, and the stomach. These allow the scientists to perform reproductive and genetic tests and determine what the snappers ate. 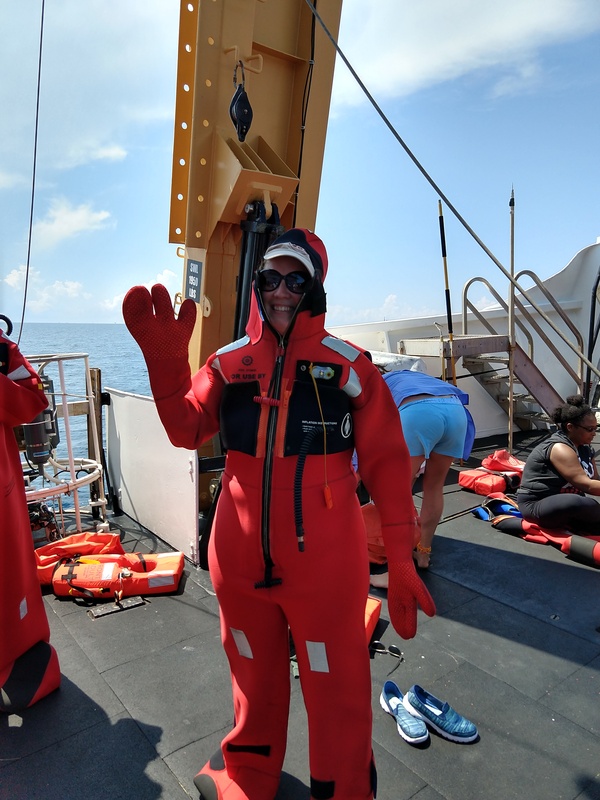 While 4 members of the science team onboard collected samples, Caroline Collatos, the volunteer on the day shift, and I insured that the samples were properly packaged and tagged. Everyone working together allowed the process to run smoothly. 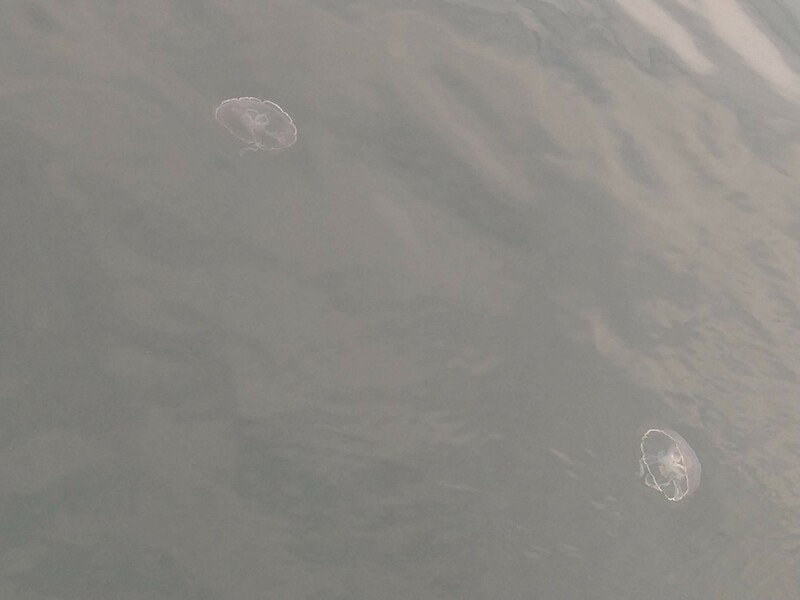 On the latest B station, which was about 110 meters deep, we caught a number of species, some of which I had not gotten to see yet. 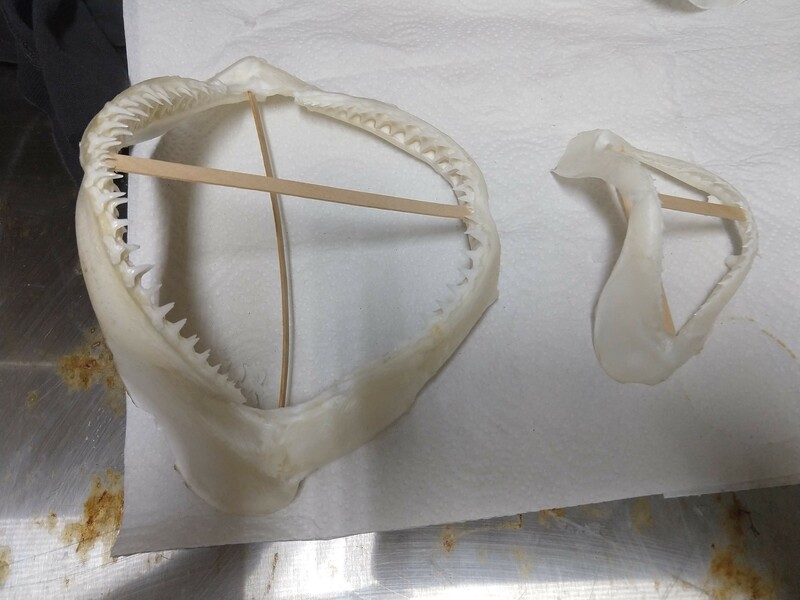 In addition to Gulf smoothound sharks (Mustelus sinusmexicanus), we caught a Scalloped hammerhead shark (Sphyrna lewini) and a Sandbar shark (Carcharhinus plumbeus) that we had to cradle due to their size. 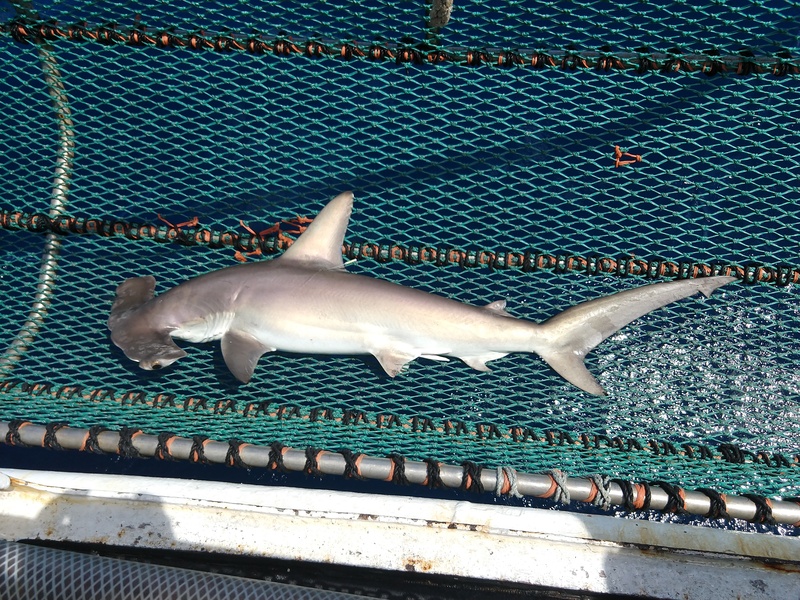 The Sandbar shark was a bit feisty, but I got the chance to tag her before we released her. We work in the rain. Thankfully, they had some extra rain gear for me to put on, so that I would not get drenched while we were setting the line. For the most part, the rainstorms have been sprinkles, but we did have one downpour while we were going toward a station. We work in the rain, so I was loaned some rain gear. Between setting lines, I have been busy checking up on my studenats’ work back in Memphis. One of the great things about having a one-to-one school is that the students are able to do their work on Microsoft Teams and turn it in for me to grade it thousands of miles away. I have loved seeing their how they are doing, and answering questions while they are working, because I know that they are learning about the cell cycle while I am out at sea learning about sharks. One of the things that has really surprised me over the past week is how much my hands hurt. It was unexpected, but it makes sense, given how much of the work requires good grip strength. 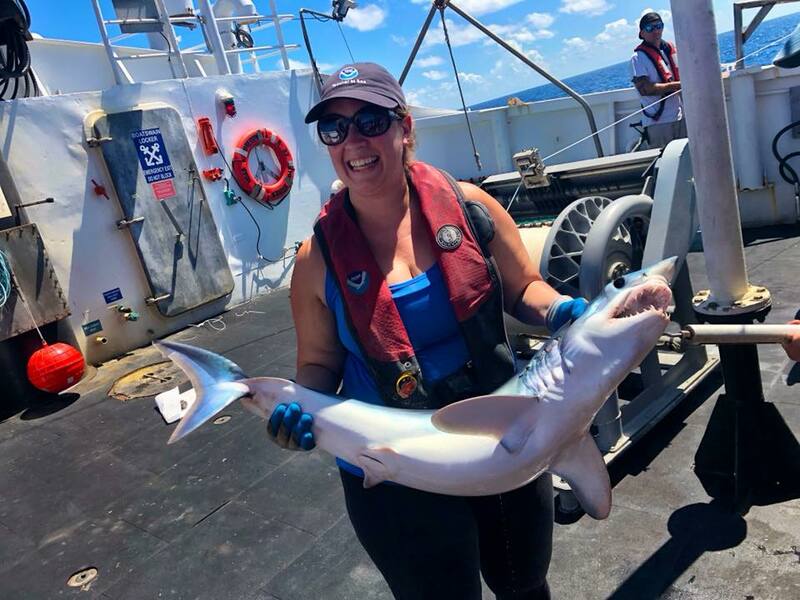 From insuring that the sharks are handled properly to clipping numbers on the gangions to removing circle hooks from fish on the lines, much of the work on the science team requires much more thumb strength than I had thought about. I know my students have commented that their hands hurt after taking notes in my class, so I thought they would get a kick out of the fact that the work on the ship has made my hands hurt. Sharks are able to sense electrical fields generated by their prey through a network of sensory organs known as ampullae of Lorenzini. These special pores are filled with a conductive jelly composed primarily of proteins, which send the signals to nerve fibers at the base of the pore. Remove the predators, and the whole ecosystem begins to crash like a house of cards. As the sharks disappear, the predator prey balance dramatically shifts, and the health of our oceans declines. My first day onboard was spent following around 2nd Engineer Will Osborn. Will is an officer in the Merchant Marines, and a NOAA Augmentation Pool Engineer assigned to the Oregon II. He invited me to follow him around and learn how the engineers prepare the ship for sea. One of the duties of the engineers is to check the liquid levels of each of the tanks prior to sailing. 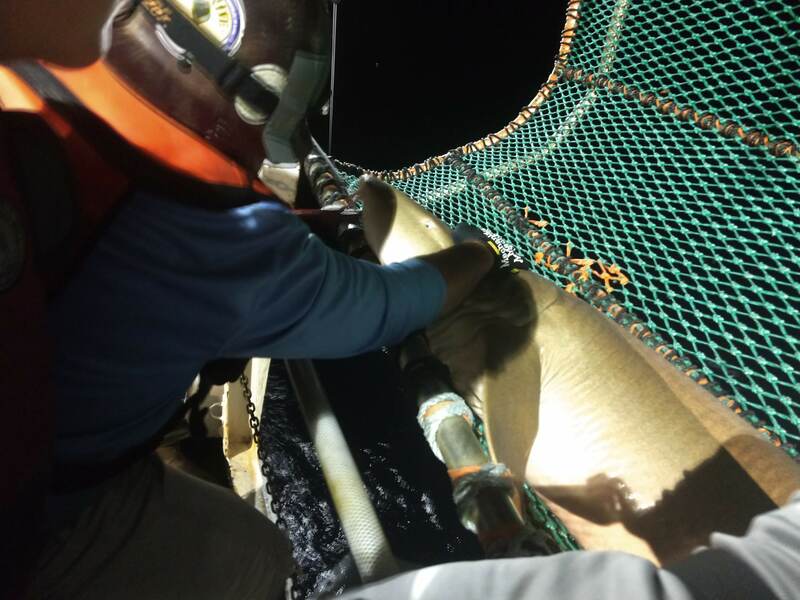 They do this by performing soundings, where they use a weighted measuring tape and a conversion chart to determine the number of gallons in each of the tanks. The engineering team then prepared the ship to sail by disconnecting shore power and turning on the engines aboard ship. 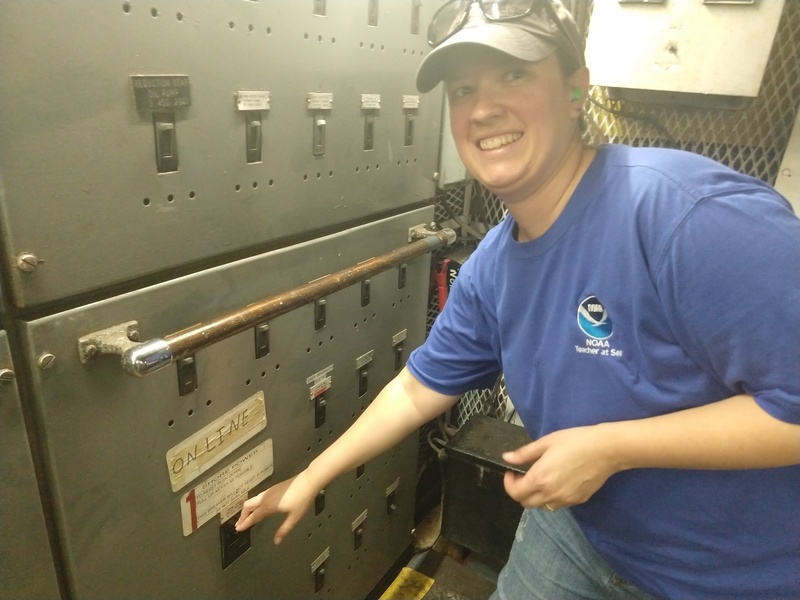 I got to flip the switch that disconnects the ship from shore power. I followed the engineering team as they disconnected the very large cable that the ship uses to draw power from shore. I then got to follow 2nd Engineer Will as he turned on the engines aboard ship. Once we set sail, the science team met and discussed how longline surveys would work. I am on the day shift, which is from noon to midnight. We got the rest of the day, after onboard training and group meetings, to get used to our new sleep schedule. Because I was on the day shift, I stayed up and got to watch an amazing sunset over the Gulf. Our second day out, we set our first two longlines. 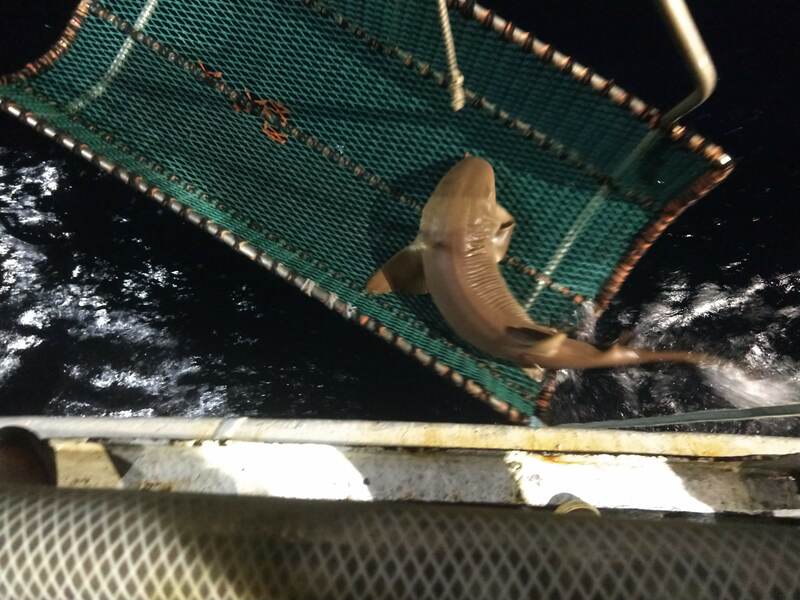 The first one was set before shift change, so the night shift crew bated the hooks and set the line. My shift brought the line in, and mostly got back unbaited hooks. 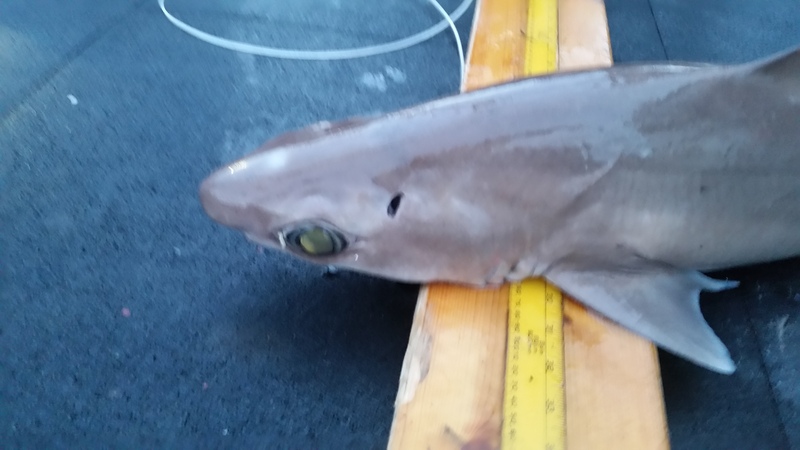 We got a few small Atlantic Sharpnose (Rhizoprionodon terraenovae) sharks on the line, and used those to go over internal and external features that differentiated the various species we might find. After the lines were in, it was time for safety drills. These included the abandon ship drill, which required us to put on a submersion suit, which is affectionately referred to as a Gumby suit. You can see why below. It was as hard to get into as it looks, but it will keep you warm and afloat if you end up in the water after you abandon ship. I have learned a few rules of the boat on my first days at sea. First, always watch your head. The stairwells sometimes have short spaces, and you have to make sure not to hit them on your way up. Second, always keep a hand free for the boat. It is imperative at sea that you always have a hand free, in case the boat rocks and you need to catch yourself. Third, mealtimes are sacred. There are 31 people aboard the boat, with seating for 12 in the galley. In order for everyone to get a chance to sit down and eat, you can’t socialize in the galley. In order for the crew to have freshwater to drink, the Oregon II uses a reverse osmosis machine. They create 1000-1200 gallons of drinkable water per day, running the ocean water through the reverse osmosis generator at a pressure of 950 psi. And when there are enough outsiders together in one place, a mystic osmosis takes place and you’re inside. How do sharks hear in the water? Greetings to those following my adventure from afar. My name is Kristin Hennessy-McDonald, but my students and fellow faculty call me Dr. Hen-Mc. I am so excited to have been selected to be a member of the NOAA Teacher at Sea Program aboard the Oregon II. I am the science lead at T-STEM Academy at East High School, where I teach Honors Biology. My path to the classroom was far from straight. I attended the University of Notre Dame, where I earned a B.S. in Biology. I then continued my academic path at the University of Alabama, Birmingham, where I earned my PhD in Cell Physiology. After spending a little less than 3 years at St. Jude Children’s Research Hospital, I had an epiphany. I found that I enjoyed sharing my passion about science more than doing research at the bench. I made the decision to transition to the classroom and have not looked back. 8 years later, I have found my home at T-STEM, and my family in Team East. The journey to boarding the Oregon II has been a long one, but well worth it. When my boss brought the opportunity to me, I applied with hope. When I got the acceptance letter, I gasped and started jumping up and down in my classroom. My students were confused, but then excited when they found out that I had gotten this opportunity. I teach many of the same students who were in that class, and they have all been sharing in my excitement over the past months as I have prepared for this adventure. I have always been fascinated by water. From the time I was a small child, my parents would have to watch carefully when we went to the pool or the beach, because I was liable to jump right in. 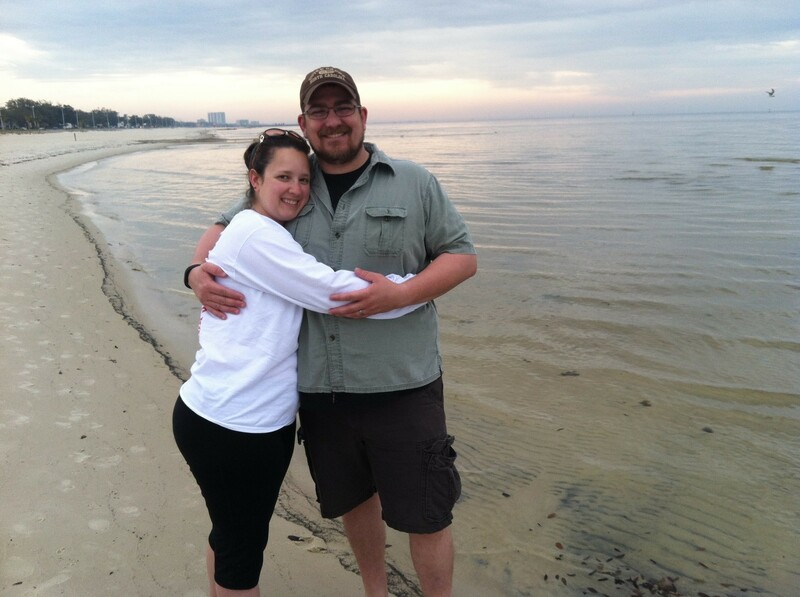 As I grew up, that love of water has remained, and I spend time each summer on the Gulf. 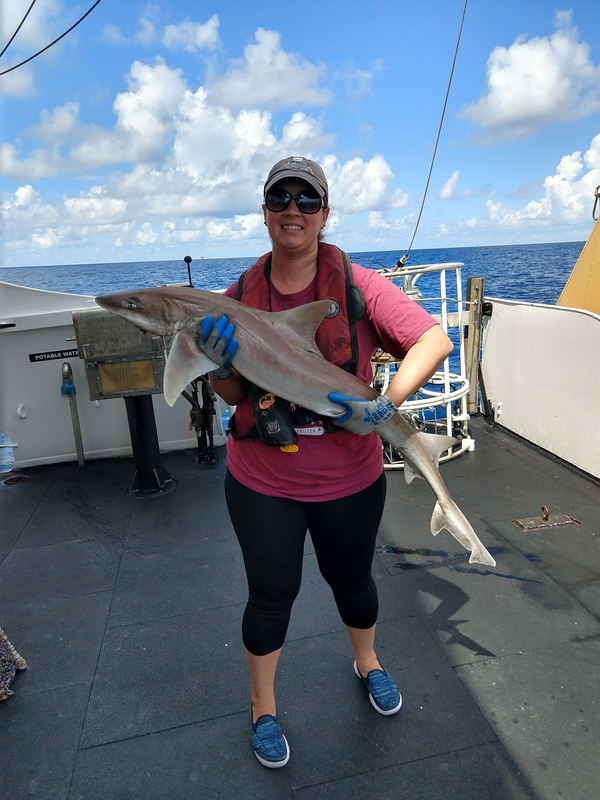 I am thrilled to have a chance to study ecosystem of the Gulf of Mexico, and see things that I only read about in National Geographic magazine. I have passed my love of water on to my daughter. Beth is the same way I was when I was young. She wants to run into the water, to play in the waves. 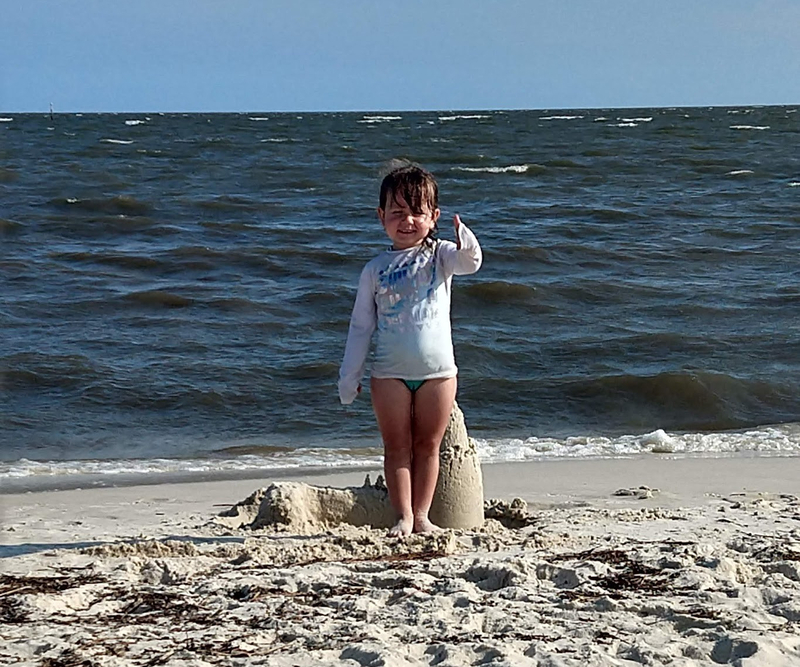 She sees the beauty of the sea, watching dolphins alongside the boat when we take trips to Ship Island out of Gulfport, MS. I look forward to sharing my adventures at sea with her. I am sad to leave her and my husband for two weeks, but grateful that they waved me off on my adventures with a smile. I began my career as a teacher because I wanted to share my love of science with young people. I dreamed of someday being a child’s gateway to the wonders and knowledge of science. While none of my students have stood on a desk reciting Whitman, some of my students have allowed my love of science to guide them along science career paths. When I joined Team East at T-STEM Academy at East High School, I knew that I was in a place that would foster the idea of learning by doing. I wanted to exemplify that going on this trip. I cannot wait to bring all of the knowledge and experiences of this trip back to my classroom. 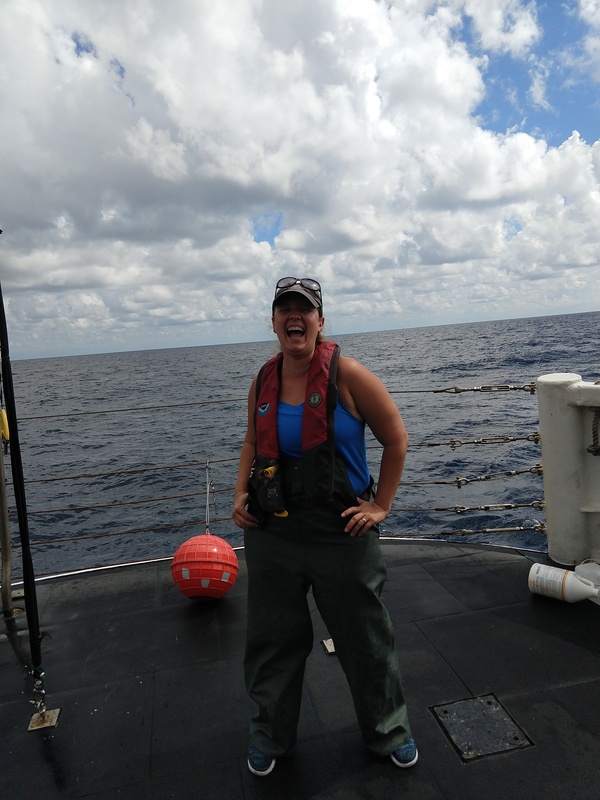 Instead of just sharing case studies of Gulf Coast ecosystems, I will be able to share what I learned as a NOAA Teacher at Sea. 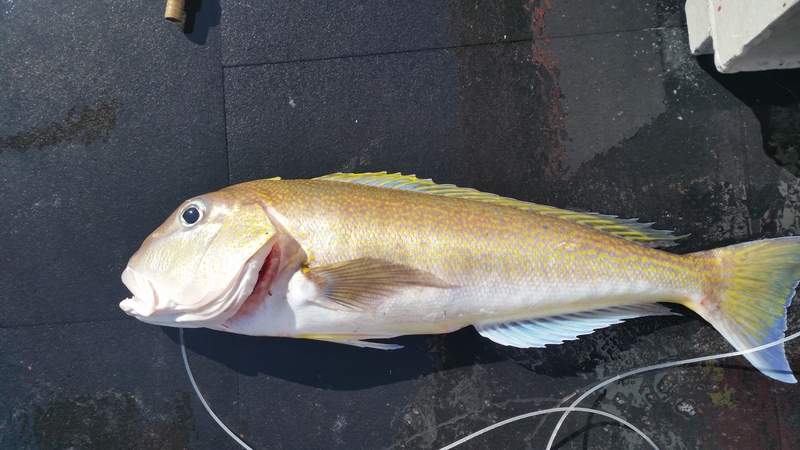 Red Snappers are considered to be one of the top predators in the Gulf of Mexico? Given that red snapper hatch at 0.0625 inches long, and can reach sizes of 16 inches within two years, do you think their cells have a long or short G1 phase?